Welcome to our department for Playground Slides and Playground Tunnels. All of these products have been designed for use in public areas such as playgrounds and parks. 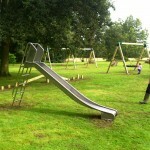 The Playground Slides have been tested according to the EN1176 standard and certified by TUV in Germany. As well as being tested in Europe, they are also manufactured here, which results in a higher quality and a faster delivery. Our Playground Tunnels are also designed to meet the same European Safety Standard for commercial use. To help reduce installation time, the Tunnels are manufactured and assembled here in the UK and delivered direct to site. 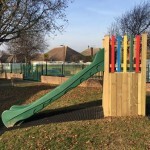 Available in a range of sizes and designs, our Slides and Tunnels are ideal for schools, nurseries, pubs, hotels and parks. For examples of our installations please visit our Commercial Case Studies. There is plenty of information on our product pages, however, please feel free to contact us if you have any questions. Our delivery charge depends on a number of factors so please contact us for a quotation. We normally hold the plastic Slides in stock, while Stainless Slides and Tunnels normally take 2 – 4 weeks for delivery. The safest, easiest and tidiest way to create an underground tunnel. Designed for use under an earth mound, these are available in multiple colours and lengths. Please note that our play tunnels are only available as part of a full playground project. Our above-ground Play Tunnels are free standing and available in Lion, Zebra, Tiger, Woodland and Dinosaur designs. Please note that our Play Tunnels are only available as part of a full playground project. For more information please see the Details tab. Commercial grade Zip Wire Set. This set includes timber and installation. Please contact us for available sizes and prices.